smart, loving, happy, adaptable, loyal, easy to train, athletic, affectionate and sensitive. So how do you care for such a special breed? It is very important to note if properly socialized, the Lagotto gets along well with dogs, children and other small pets. Shyness can run in the breed so it is imperative that early socialization is offered. Every owner wants to protect their puppy, but we must remember it is equally important the Lagotto lives in manner where he/she is responding to events in a positive healthy way. There is a small window in a puppy’s life where it is crucial the owners expose their Lagotto to as many different stimuli as possible. Activities such as attending a puppy obedience class, trips to town to meet and greet strangers, exposure to a variety of sounds like passing cars/sirens, doorbells are all great examples of how to assist with socialization. However, do not forget to also expose your puppy to different surfaces, medical equipment such as wheelchairs and crutches, as well as introduce people of different sizes and shapes. Remind yourself that everything your puppy sees is new to them. Things we take for granted just might be the thing that ends up scaring your puppy. So work to introduce your puppy to as many new experiences as possible. And don’t forget to reward handsomely throughout those experiences. While socialization is crucial during the early weeks, it is important to remember that proper socialization is a life long process. Long walks in the park, doggie play-dates, visitors coming to the house are all examples of opportunities that will help to nurture the socialization process throughout your Lagotto’s life. The Lagotto bonds strongly with their families and thrives best with lots of interaction. 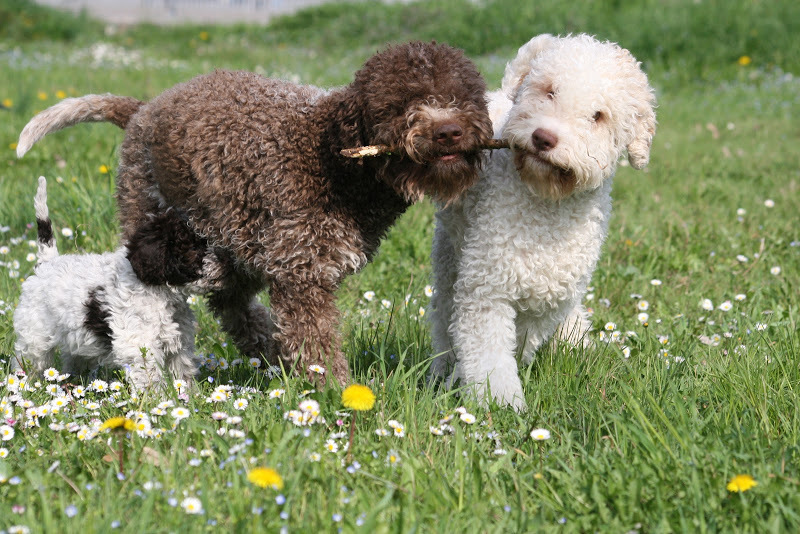 The Lagotto is a breed that is social and as such, needs to live indoors and be a part of the family. Pleasing their owners is priceless. 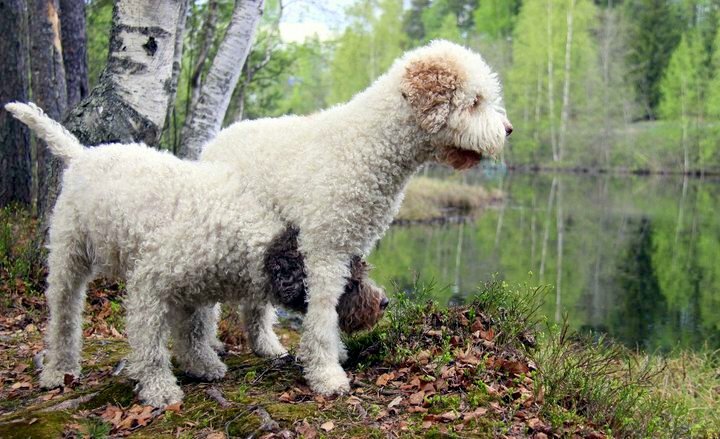 While a Lagotto will enjoy and benefit from activity and time outside, this is not a breed that will thrive when left outside to live without the family interaction. The Lagotto needs this interaction in order to be well adjusted and content. The Lagotto is active but not hyper. They are intelligent and do best with owners who are active and commit time every day to play or exercise. Owners must be willing to invest the time needed for training. The Lagotto loves to work, be challenged and please their owner. As such, they delight in training and are good problem solvers. If a Lagotto’s needs are not met, they will make their own “fun”, which most likely will not be the family’s idea of fun and retraining is always a more arduous task. Historically the breed is a working one and will need both mental stimulation and physical exercise. Besides truffle hunting, the Lagotto can be found doing search and rescue, participating in therapy work, “sensing” various medical conditions, and game-hunting to name a few. Their intelligence, jumping ability, and drive make them ideal candidates for various canine competitions such as rally, agility, tracking, obedience, dock diving and nose work. Most are naturally drawn to water and love to swim.